Kazakhstan's President Nursultan Nazarbayev, who was re-elected, greets his supporters during a post-elections rally in Astana April 27, 2015. This article was originally published by EurasiaNet.org. 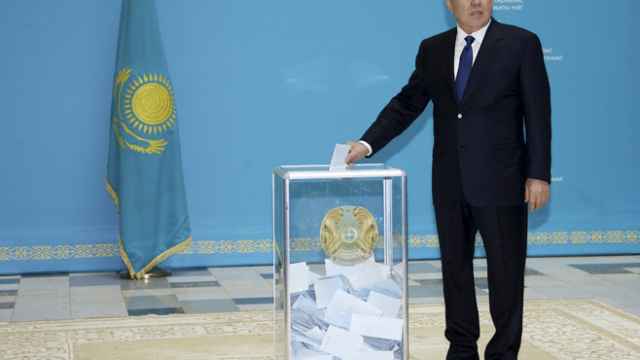 The results of the April 26 presidential election in Kazakhstan offer a good illustration of President Nursultan Nazarbayev's aversion to what he described last month as "forced democracy." He won reelection with almost 98 percent of the vote. The election victory for the 74-year-old Nazarbayev, who in addition to the presidency also holds the official title Leader of the Nation, came on a record turnout of 95.22 percent, according to preliminary results released by the Central Electoral Commission the morning after the vote. "Kazakhstan has demonstrated its high political culture and democracy to the international community," Nazarbayev told supporters during the evening of the election. At a subsequent news conference, the president professed to be embarrassed by the Soviet-like level of voter support for his reelection. "I apologize that for super-democratic states such figures are unacceptable: 95 percent participation and more than 97 percent [of ballots cast for him]. But I could do nothing. If I had interfered, I would have been undemocratic," said Nazarbayev, who has led Kazakhstan since before the 1991 Soviet collapse. Nazarbayev trounced two little-known challengers — Turgun Syzdykov of the government-loyal Communist People's Party of Kazakhstan, who received 1.6 percent of the vote, and Abelgazi Kusainov, a member of the ruling party led by Nazarbayev, Nur Otan, who trailed with 0.7 percent. 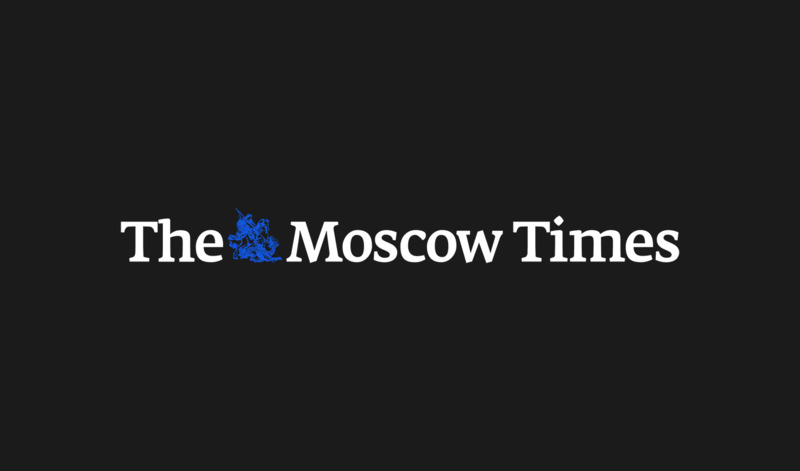 Observers from the Organization for Security and Cooperation in Europe (OSCE) said in a statement released on April 27 that a "lack of genuine opposition limited voter choice." "The incumbent and his political party dominate politics, and there is a lack of a credible opposition in the country," Cornelia Jonker, the head of the OSCE mission, stated. There were also "significant restrictions" on freedom of expression and the media environment. Nazarbayev has regularly cautioned that the democratization process in Kazakhstan needs to be carefully managed in order to preserve domestic stability. Nazarbayev has defended Kazakhstan's democratic record in the past: once remarking that in terms of democracy, "our glass is half or three-quarters full, and we have to fill it up." Nazarbayev's critics charge that the government exaggerates the threats of political instability in order to squash legitimate political opposition. There are no genuine opposition parties left in Kazakhstan and prominent opposition leaders have been neutralized or jailed. While the OSCE observer mission deemed the election "efficiently administered," it noted "serious procedural deficiencies and irregularities" during voting, counting, and tabulation, "including indications of ballot box stuffing." Observers from the CIS and Shanghai Cooperation Organization (SCO) offered a starkly different portrait of the outcome. They hailed the election as "free" and "democratic," and Kazakhstan's prosecutor's office denied there were any serious violations. 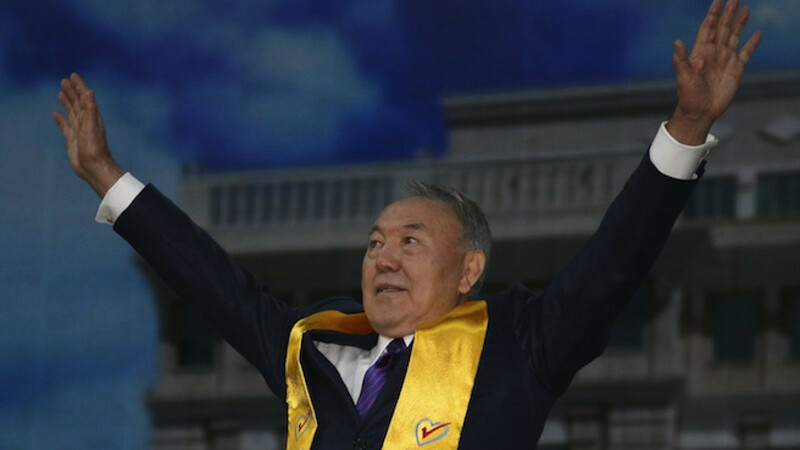 Nazarbayev's 97.7 percent win marked an increase over the 95.6 percent share he won in the 2011 presidential poll. It also established a benchmark for authoritarian-minded former Soviet republics: Nazarbayev's vote share topped the 97.1 percent reaped by Turkmenistan's Gurbanguly Berdymukhamedov in 2012. Nazarbayev — who enjoys a personal exemption from presidential term limits — said the results made "tears well up in the eyes." A photograph of him at a victory rally in Astana published by Tengri News showed him looking indeed slightly tearful. "Today is a wonderful day. Kazakhstanis have again demonstrated their cohesion, the unity of a multi-ethnic people that conquers all hardships," he said. "From this, you start to think day and night how to make it so that our people live prosperously and improve their well-being in life with every day, so that they can look confidently to the future." Nazarbayev specified that his top priority is pushing through his Nurly Zhol stimulus package, which is designed to soften the social blow delivered by Kazakhstan's economic slowdown. The OSCE — an organization that has never deemed an election in Kazakhstan free and fair — said the electorate had been pressurized: "Credible reports of pressure on voters to attend rallies and vote in high numbers for the incumbent raised concerns about their ability to vote free of fear of retribution." On Election Day, many polling stations in Almaty appeared quiet, with just a trickle of voters, though several polling station bosses told EurasiaNet.org toward the end of voting that they had turnouts of 85-90 percent. A straw poll of voters in Almaty conducted by EurasiaNet.org showed diehard support for Nazarbayev. "I voted for Nazarbayev," said pensioner Valeriy Chernoknizhniy. "I have confidence in him. Let him rule as long as he has his health. The main thing is we have peace and stability in Kazakhstan."